I’m not sure what’s happened here, but it looks like the interurban has emerged victorious. I don’t know the original source of this photo, but I came across it on the Northern Texas Traction History Group on Facebook. 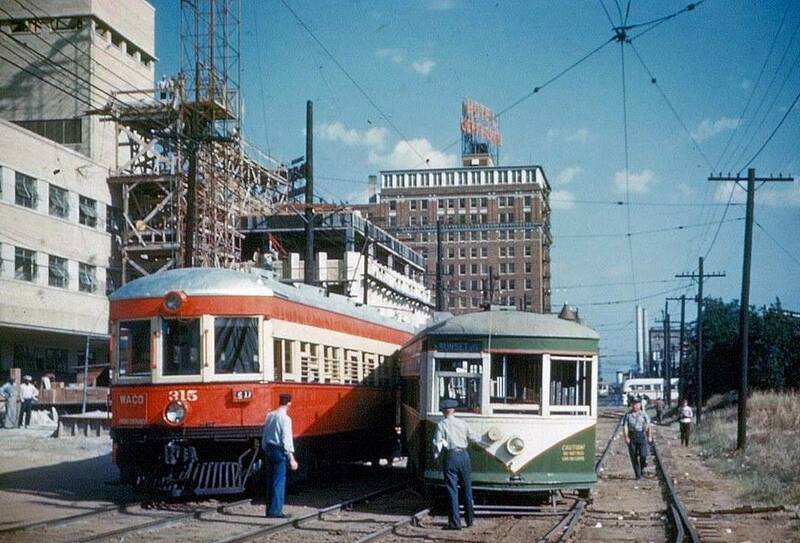 The electric-powered interurban car is the big red one on the left; the puny (but cute) electric-powered green streetcar is on the right. The view here is looking north on Record, from just south of Young Street, inside what would one day be called “Communications Center”: the Dallas Morning News Building is on the left, and the not-yet-built WFAA studios will later be to the immediate right (east). The long-gone Hotel Jefferson is north of Ferris Park (the hotel was catty-corner from Union Station, across Houston Street). In the distance you can see the tippy-top of the Old Red Courthouse, just above the green streetcar. Also, those now-gone smokestacks that were such a fixture on the skyline are straight ahead. Actually, the Jefferson sat cater-cornered across from Union TERMINAL. Silly little point, but it does seem to matter. Honestly, Paula, I enjoy your site very much. I only wish the train-loving pedant within me was consistently satisfied with your approach to railway matters! Oh, well. At least you understand the difference between streetcars and interurbans – and refuse to use the horrific term “trolley” to describe the former! Thanks for pointing out the Jefferson Hotel error. I’ve corrected it. No one seems to have noticed that there has been a collision between the two cars.